Well paced, our route is on a combination of quiet gravel tracks and earth roads that skirt immense lakes and pass through sleepy villages, allowing us to absorb ourselves fully in the Lake District, its people and their way of life. Accommodation along the way is a combination of small hotels, lodges, cabanas and family run hospedajes (South American guesthouses), chosen for their location, hospitality and friendly welcome. 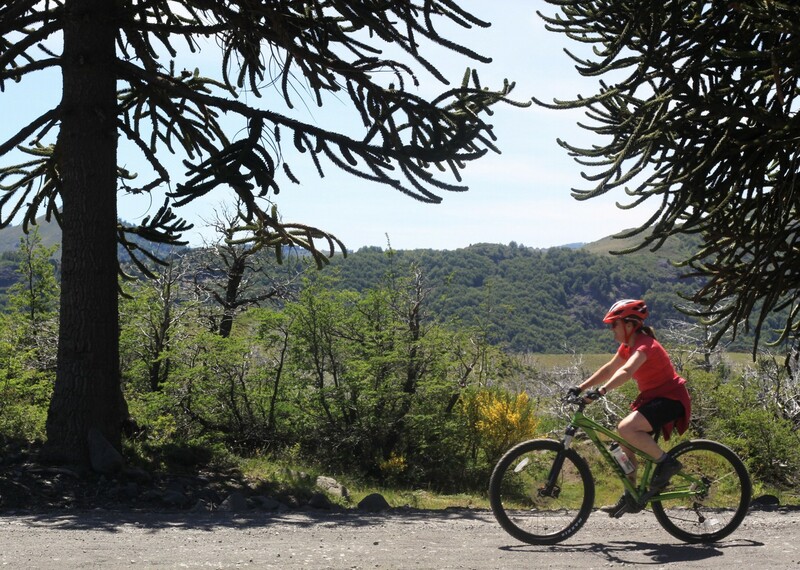 Our initial cycling takes us past the Parque National Alcerce Andino, before heading along the shores of Estero Relconcavi to arrive at Lago Llanquihue. 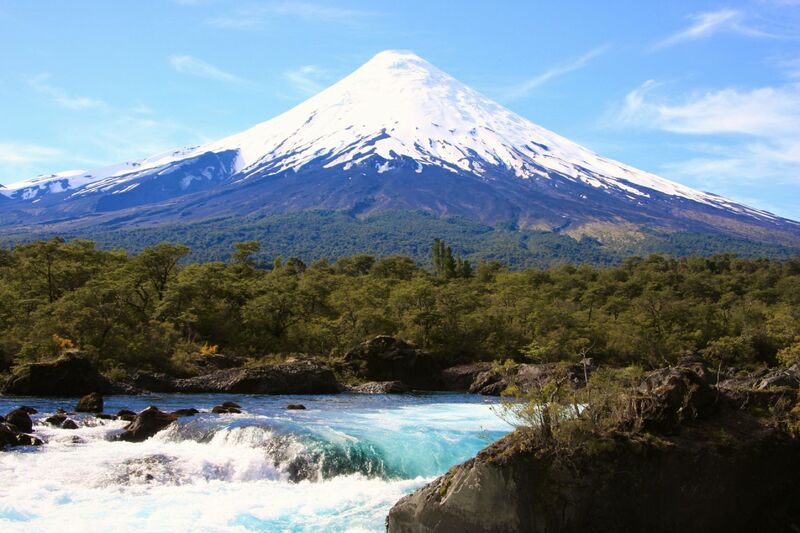 From here you'll have superb views of the impressive Volcano Osorno and we'll bne able to visit the crashing rapids and waterfalls of Saltos de Petrohue. The next day we head into Argentina, and Villa La Angostura, from where we move on to Bariloche, a place famed for its chocolates and Swiss style architecture. 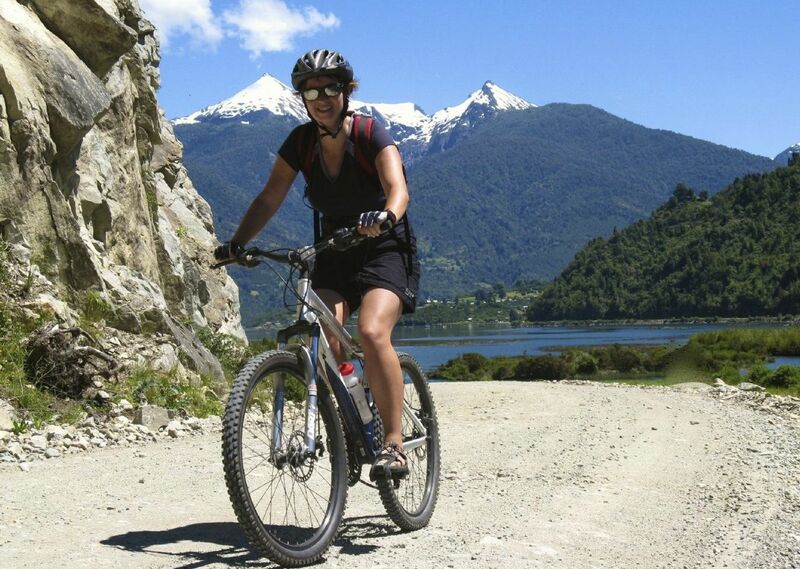 From here we head along the lovely Ruta de Las Siete Lagos‚ to San Martin de los Andes. More incredible volcanoes and towering arucaria trees line our route back to Chile. 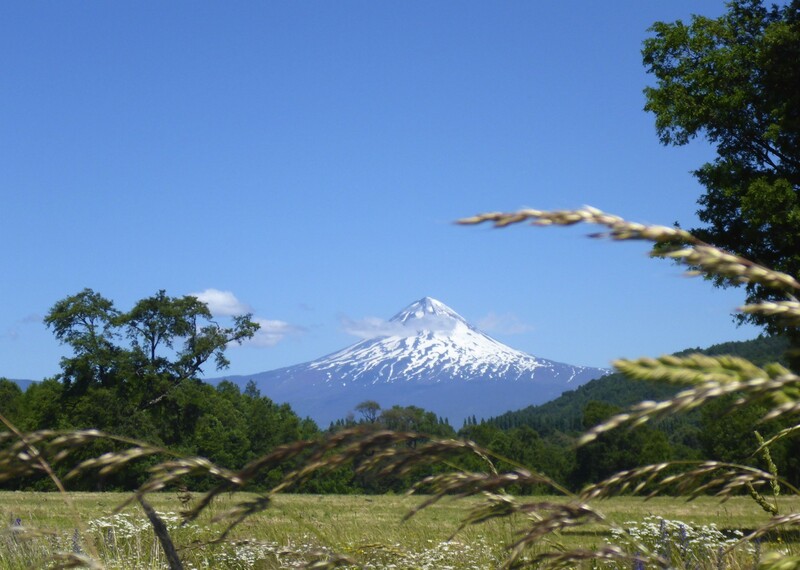 Volcan Villarica beckons us to the picturesque town of Pucon, from where we can take an optional hike to it's lofty summit. 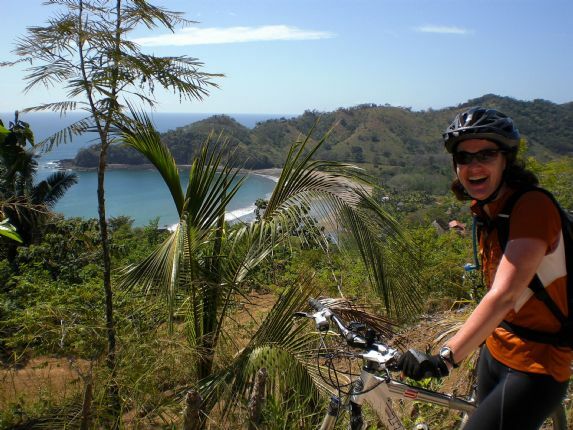 Just a couple more days biking left and for many the highlight of the trip, as we wind our way through stunning scenery of Conguillio National Park. Our final night is spend in Temuco, from where next day we take the domestic flight to Santiago for our onward connections. I have never experienced anything like this before! This holiday had everything. It was my first visit to South America and I loved every moment. The organisation of the trip was excellent, making it easy to relax and enjoy throughout. The guides were simply wonderful, highly professional, engaged well with the group, fun, and extremely knowledgeable about the area. 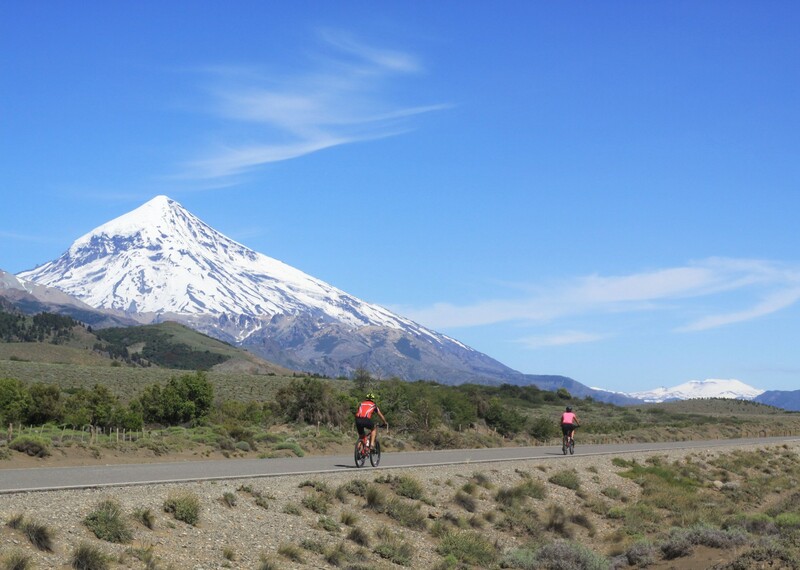 The cycling was superb and the briefings prepared us well for each days cycling (what we would see, and experience , and with very good emphasis on safety advice) The non-cycling day had plenty of options to choose from – I chose the volcano climb which was quite an experience. This is one of the very best Skedaddle holidays I have experienced. 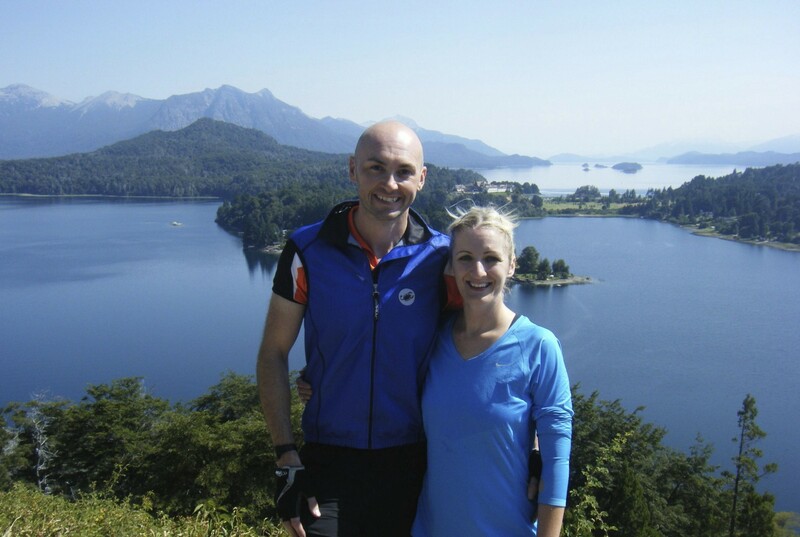 The route selected for this holiday was really interesting, varied – Chile and Argentina – quite different. So well chosen. The accommodation provided also must be classed as excellent. Lunches – all prepared by the guides – were simply superb. Lots of variety, all very fresh, and good, nutritious food – absolutely brilliant. We chose to eat dinners with the guides and the rest of the group for all our evening meals. The restaurants chosen by the guides were excellent and gave a good taste of local cuisine, with plenty of variety. On route refreshments were readily available – plenty of fresh water and energy providing foods. Our tour leaders along with the two support guides made an excellent team. They made sure everything ran smoothly and were highly professional, confident and knowledgeable about the area and culture. They were very friendly and made the holiday fun and exciting. They were well organised, and paced the cycling well for the mixed group. These leaders were amongst the best we have experienced with Skedaddle holidays. The support vehicle was new, smart, well maintained and very comfortable. Plenty of room, comfortable seats and good air conditioning. Hire bikes were superb for the terrain we were to ride on. Also very well maintained throughout the trip. As for the cycling, I loved all of the days. The gravel trails were challenging at times with the loose surface – but I enjoyed the challenge. Tarmac roads were a good smooth surface. The scenery never failed to amaze me with such beauty and vibrant colours – just stunning. Then there were the snow capped volcanoes, clear blue waters of the lakes, the bright blue skies, monkey puzzle forests and of course the single track. Utterly amazing was the Valley of the Monuments – I have never experienced anything like this before! We will always have very fond memories of this one. We have had mainly outstanding holidays with Skedaddle, and this was no exception. Indeed, it was right up there amongst the best of the bunch. We had wonderful travel companions in the group: we all got on well. The service provided by the guides was excellent: very attentive to our needs, our welfare and safety, which were always paramount in the guides’ concerns. The trip provided a terrific view of central Chile, beautiful scenery, and was very informative about a number of things (history, geology, plant and animal life, etc). The whole tour was well-planned and designed to yield a top class holiday. We will always have very fond memories of this one. The cycling was good – what I called a ‘Soft Grade 3’ (i.e. not too difficult, although a bit gravelly in parts)... as I said, not too difficult, I am 74 years old! Mainly very good accommodation, and our Skedaddle picnic lunches were excellent! We had an excellent tour guide and supporting personnel. Our tour leader was one of the best tour guides that I have ever encountered. Very professional. He was always on the ball, well organised, helpful and full of information. He really did care for our welfare and safety! The other guides also worked their socks off, servicing and cleaning the bikes, and providing especially fabulous lunches. Pre-holiday information is generally very good, and I got so much for my money. I could never have replicated the services (research, planning, guidance, food, transportation, accommodation, etc etc) received on this holiday by use of my own limited resources. In fact, it would have been TOTALLY IMPOSSIBLE. To get all this knowledge and help and efficient management ‘off the peg’ at the set price makes this holiday a hugely generous bargain. Could not have planned it better if it was Hollywood! Pleasantly surprised at the wonderful lunches. Our guide excelled not just with the quality of produce but his attention to detail with presentation…5 stars! 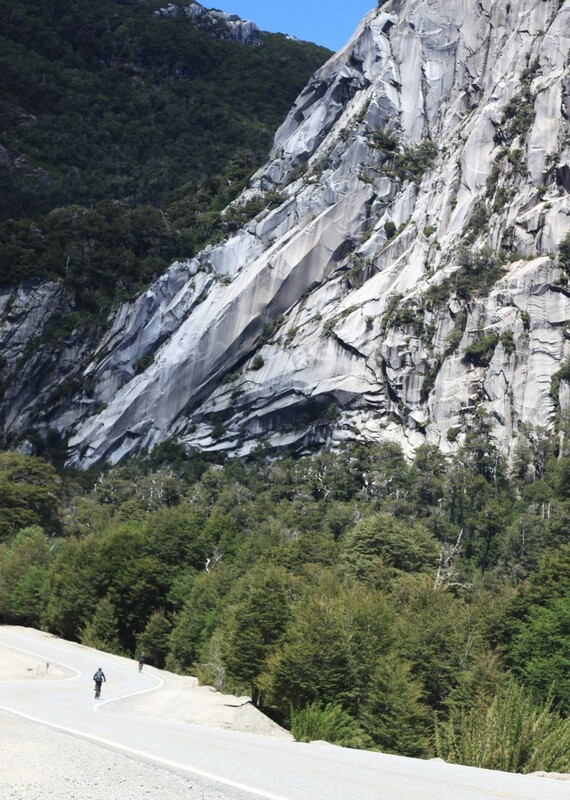 Hard to choose a favourite day, but probably day 8 – Villa Traful to San Martin. The fantastic scenery, variety of cycling…an 18km decent!! Highlight of the trip was our lunch stop just before the Argentinian border where a group of Gauchos on horseback were herding cattle, the backdrop was a Volcano – could not have planned it better if it was Hollywood! All 4 of our guides were sensational. Nothing was too much trouble….they had just the right combination of organisational skills, technical support, communication and above all a genuine sense of fun…they were a great team and it was obvious they worked well together. We were in good hands. Would highly recommend this trip to others. Overall, this was a fantastic experience. 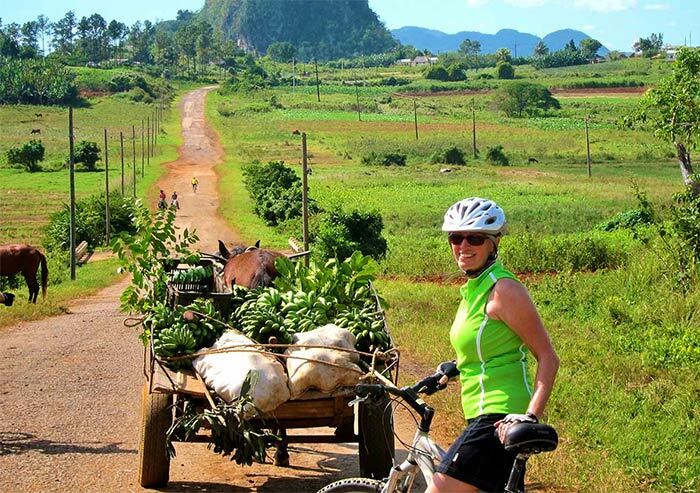 Great cycling, incredible scenery and wonderful food. The wonderfully prepared lunches at the side of a lake or some other scenic spot were delicious. The standard of hotels/lodging surpassed my expectations… we stayed in some very charming hotels and all of the group dinners were great culinary experiences while being great value. This trip exceeded expectations from the point of view of fantastic hands-on guides, scenic cycling on quiet roads and great food. Would highly recommend this trip to others. Our tour leader did an excellent job guiding us. Nothing was too much trouble. Maintained a great sense of humour and never got stressed. Very professional in all of his interactions. His passion for the job shone through. The other guide worked hard every day to provide a great service to all guests. He jumped into all activities with a lot of enthusiasm and energy… helping out with everything. A big asset to the group and the tour and his sense of humour really made it a very enjoyable experience for everyone. Both drivers were excellent. Safe driving, very helpful with luggage, friendly and engaging with the group and fantastic at preparing and presenting very tasty lunches! There are no words to describe HOW fabulous this holiday was!!! This has been the best holiday I have EVER had!! The guides were phenomenal! Every problem I encountered they fixed. Jason’s knowledge of the wildlife and history of Patagonia is so extensive that we never missed an opportunity to have our trip enriched further by information we were offered. Alvado and Victor were the most cheerful drivers I’ve ever met – don’t think they could be as accommodating to a bunch of pestering tourists – and their food was fab!! So much so that I lost NO weight during this holiday. This was the best cycling holiday we've had. This was the best cycling holiday we’ve had, and I’ve done about 10 around the world with you and others. Guide and team were fantastic, lots of going above and beyond the call of duty, and outstanding communication all the way through. There was a wide range of accommodation, and all were appropriate to location and local availability. Our bus driver did all the lunches fresh on the day and they were outstanding. Our tour leader was completely outstanding and loved his role in explaining stuff about the country, history, flora/fauna etc. The other guides were all great, cheerful, friendly and efficient. It was everything I had hoped it would be – absolutely brilliant! I appreciated the advice given when talking about the holiday during booking, and the follow up phone calls. It was great to have a real variety of accommodation, some luxury, some unique and off the beaten track, and all clean and comfortable. The salads and fruit provided at lunch were delicious, and there was no shortage of snacks. 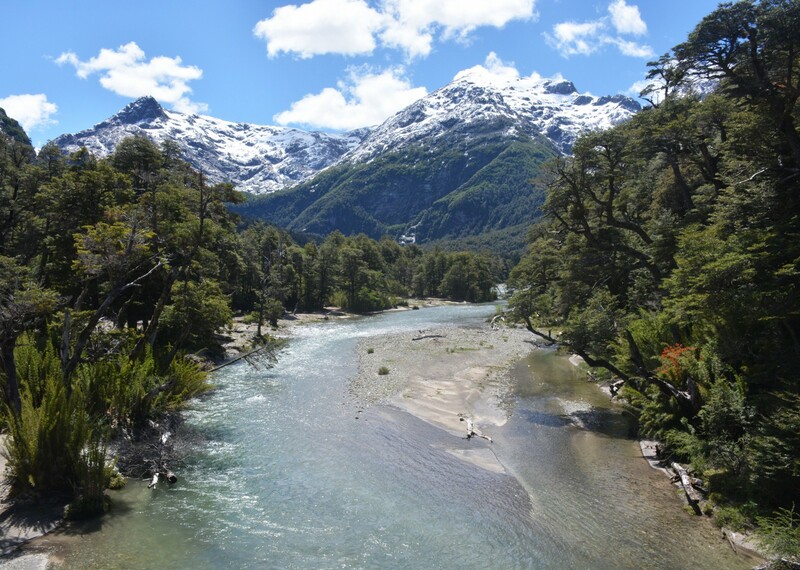 Hard to say which was my favourite day, they were all amazing – but probably day 7 from Bariloche to Confluencia – the valley was beautiful. All of the 4 guides were really great, friendly, helpful, professional and prepared delicious food. They all worked really hard to make sure we had a great holiday. They gave good instructions for each day, were really organised and had some good knowledge about birds and plants. Worth every penny! 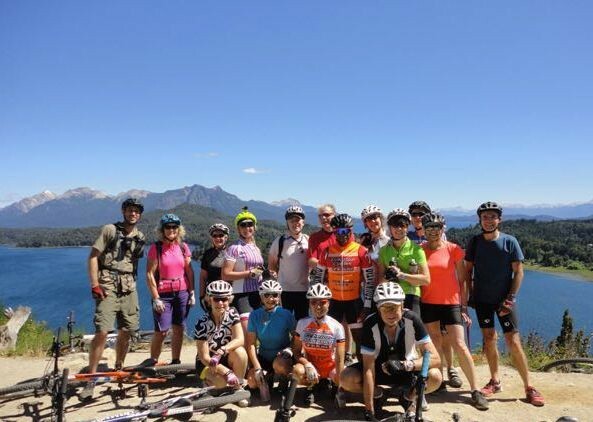 My favourite day from a landscape point of view was ‘Day 7 – Bariloche to Villa Traful‘. The trail we cycled through had the most beautiful views that I have ever seen from a bike. The lunch stop by the river was idyllic. One of the best guides we have ever had. 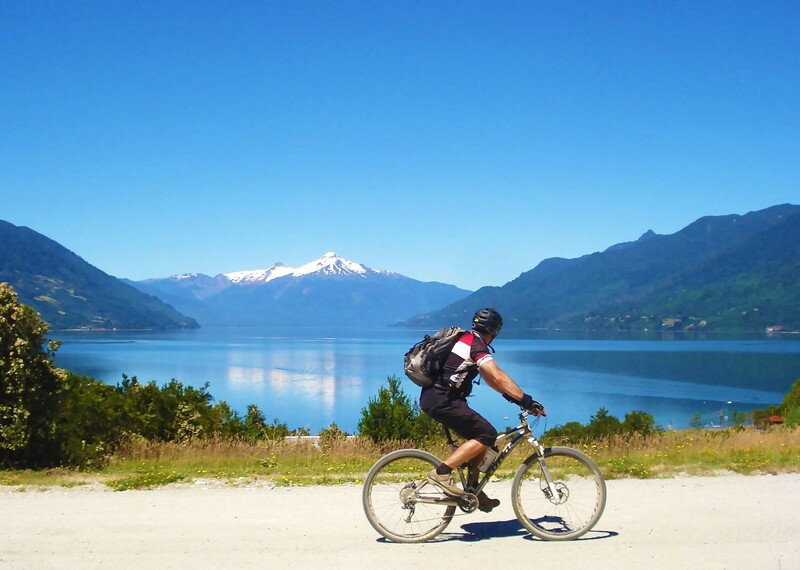 Chile and Argentina Lake District is an amazing, although somewhat challenging, ride. The scenery is stunning, and the food is amazing. I had no desire to visit these two countries, really don’t know why, but my husband has always wanted to so I gave in. I am glad I did – just to be surrounded by all the volcanoes and lakes while riding is stunning. The scenery was wonderful every day with all these lakes and volcanoes, and changing plant/tree species – really there are no words for this! Skedaddle was very responsive to all the questions we had and provided quick answers. One of the best meals for dinner was when the guides made us a BBQ dinner on New Years Eve – the food was great. The guide team made excellent, wonderful lunches every day. The snacks, mostly chocolate, on the bus were well received by one and all. Our tour leader was an excellent guide. Very accommodating to desires and wishes of riders, very encouraging, very personable, very knowledgeable. In about 30 years of doing this type of tour, he was one of the best guides we have ever had. His knowledge about the area is amazing and his English is great. He really knew how to “lead” a tour and was always smiling. Our other guide was also excellent. His smiling personality and ability to make any situation funny/fun is amazing. He went out of his way to be helpful to everyone. He and Vicente make a truly great team and really made the ride the fun tough as it was. The driver they had for this ride, was beyond excellent. His driving was amazing, he always kept the bus clean, although his English was minimal we could always make ourselves understood and he always had a smile on his face and kind words for everyone. I think the whole group felt that he was “one of the guides” that is how involved his was with everyone’s comfort. Las Cascadas and Correntoso in particular were superb (accommodation). Delicious healthy salad based lunches were made by the crew. Water and snacks were provided on the van – which was excellent… Accommodation wise…. Las Cascadas and Correntoso in particular were superb. 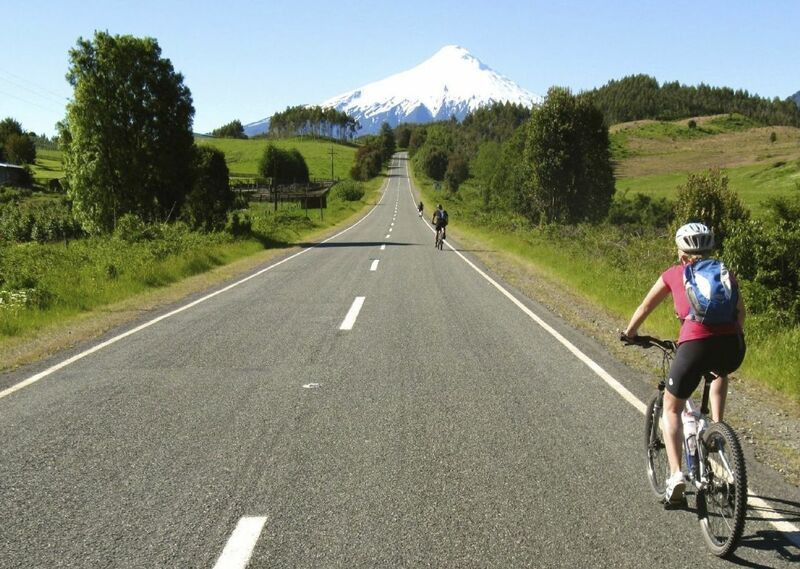 Saddle Skedaddle’s Chile and Argentina Lake District cycling holiday starts off on the shores of one of the largest lakes in South America – Lake Llanquihue – and then visits the Vicente Pérez Rosales National Park before crossing into Argentina at Paso Cardenal Samore. I loved the whole trip so much that I am seriously considering doing the same tour again!! 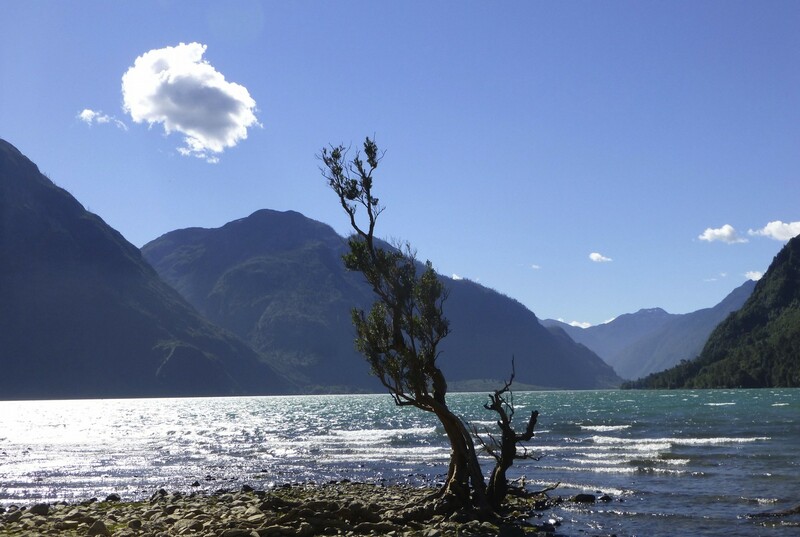 The Chilean/Argentinian Lake District has one of the most beautiful, diverse and un-spoilt scenery, which is ‘mind-blowing‘. Great guides and superb accommodation in most places. Tour Leader Jason went out of his way to accommodate everyone. He was very polite, always good humoured and very encouraging. His knowledge of flora and fauna was impressive. Albero, the driver and cook was also extremely helpful and good humoured. Unfortunately, our limited knowledge of Spanish and his of English didn’t allow us to get to know him better. The cycling was not easy but at the same time very satisfying for having achieved it all. I cycle quite frequently in the UK, but am not a fanatic, always try to avoid a hill! Not possible on this trip. I found it tough the first two days but then got into a ‘rhythm‘! It wasn’t easy but I loved it and am very proud of myself for having achieved it! I loved the whole trip so much that I am seriously considering doing the same tour again!! Best organised trip I’ve ever done overseas! Guides were just amazing – best in all the various tours I did whilst in South America. Can’t sing their praises enough! The training they get from Saddle Skedaddle really pays off. Seriously great hotels, brilliant restaurants we were taken to, really fabulous lunches, stunning scenery, superb itinerary with heaps of variety, lovely fun group Best organised trip I’ve ever done overseas. They were great fun but very organised and professional when the van broke down, and more than helpful when I requested help re obtaining a bus ticket not even part of their tour. Simply WONDERFUL!! The scenery is stunning and the cycling quite challenging. 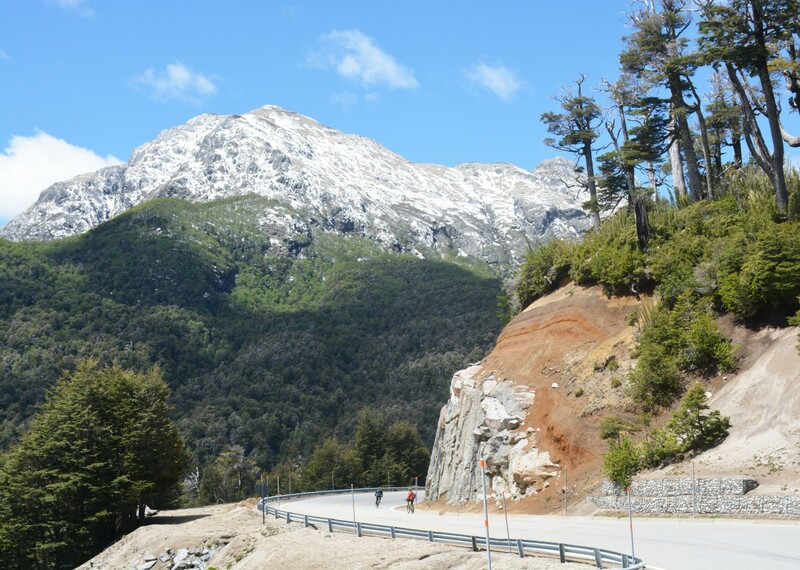 The Circuito Chico near Bariloche was a beautiful ride with superb scenery. Ernesto (tour leader) was wonderful. He was always cheerful and had to cope with dreadful weather on a few days – he did so with charm and consideration. He tried to consider everyone’s needs and was unfailingly patient and charming. 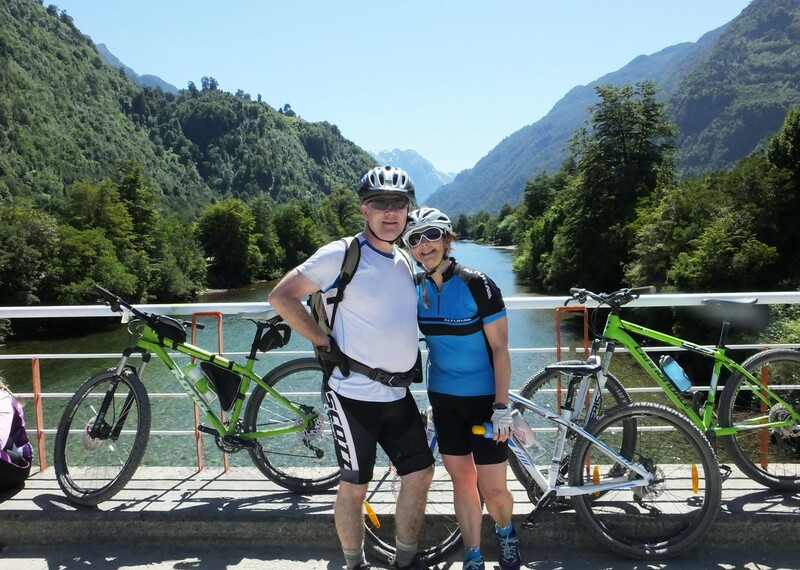 Brilliant holiday – the scenery and routes were beyond stunning, the team (guides and drivers) were wonderful and the cycling was challenging but very manageable. Saddle Skedaddle's service was perfect! Incredible scenery. Lakes, rivers, seas, fjords, mountains, volcanoes, desert, fields all in 2 weeks. My photos are incredible! Skedaddle Service was..In a word, perfect. Enjoyed the trip – a good bunch of people. Excellent accommodation and meals and the routes were lovely with fantastic scenery. Ernesto did us all proud (cool and collected) as guide and Luciano equally so in his role as driver and lunch provider. Initially it seemed an expensive holiday but the accommodation was great and the cycling was very well supported. I have been impressed by the Skedaddle service and have heard good things about other trips from fellow travellers! Having never really spent much time on a mountain bike it was quite challenging. The scenery was amazing so I did stop more to take photos and appreciate the view. I truly appreciated Ernesto’s (tour leader) leadership skills. He has a sense of humour that you can’t help but appreciate. He was intelligent, patient and talented in multiple aspects. The general standard of the hotels was above our expectation and the food – particularly Luciano’s great spreads at lunch – was at all times excellent – I never did work out how and when he got fresh bread, meats and salad stuffs when we were in the middle of a National Park with no shops within miles. Would we go again? Yes, most definitely we would and we’d choose the same bunch of guys to go with – we all gelled so well – but that was not coincidence, it was down to the morale and esprit de corps engendered by great leadership and quiet, assured management. Ernesto you are the best. We stayed in a mixture of places and the cabanas were wonderful. Overall, it was interesting to stay in such a range if places including the more unusual. I love that the hotels all serve cake for breakfast! Our lunches were truly incredible. The expectation of Luciano’s salads got us through the morning rides, and his guacamole deserves a prize. Really appreciated that we were taken to restaurants for dinner that had been researched, tried and tested. My favourites were the simple grills in the most rustic settings! The tour leader was patient, knowledgeable and happy to help with whatever issue. A great guy! Everyday of cycling offered something different! There was a distinct quickening of the pace with the prospect of lunch in view! However, arriving early made no difference as there was, without exception, more than enough to go around. Luciano was at all times delightful, helpful and accommodating. Saddle are indeed fortunate to have such a strong duo with him and Ernesto. They made the holiday. The best group trip I've EVER had!! Hard to pick a favourite day – all were different and fantastic scenery. Think the day going through the “Wild West ” was my favourite. Such great variety of scenery each day – such a well thought-out itinerary. Good van support and transfers. Really lovely accommodation – real variety but superb. Both Ernesto and Vicentes were great. They enjoyed each other’s company so much their heart-warming laughs were infectious. Great instructions without going overboard on details, but always willing to give answers about geography etc… when asked. 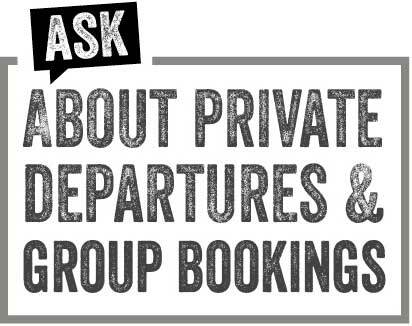 Very helpful to me about extra bookings for ongoing travel – just wonderful guys! The training Skedaddle gives them really pays off plus their own fun personalities. Compared with any guides I’ve been with since, they are right at the very top. Our second trip with you and I loved it. Challenging but quite manageable. More off road than we care for but we’d done a one day course in preparation and that proved very useful. We were pretty much the least experienced cyclists in the group but we coped well and the others were all lovely, encouraging us on the rides when we did come in last. The others in the group were really nice, interesting travelling companions and the atmosphere was terrific. It was an extremely slick and seamless experience – possible only because of the amount of constant behind-the-scenes planning, phone calls etc. The (seeming) ease with which everything happened just added to the pleasure. Excellent service provided every single day! Our local guide, Ismael, and local driver/cook, Rodrigo, were excellent. They provided us with excellent service every single day and made sure our needs were met. I cannot say enough about how much I appreciated their service. Rodrigo, provided us with excellent, healthy lunches every single day which we thoroughly enjoyed. He also provided healthy snacks whenever we wanted them. Logistics management, briefings and overall support was exemplary! Every day was great and the briefings were excellent. Some of the gravel roads were an adjustment for this road rider. I was impressed with the quality of the paved rides. I had just previously completed a ride through Umbria and La Marche in Italy and commented on the poor quality of the roads in many areas. This was far superior. Jason and his team were outstanding. Their logistics management, briefings and overall support was exemplary. Jason’s knowledge and briefings about the natural and historical highlights of the region greatly enhanced the overall experience. Most importantly they were a delight to be with and because of their hard work the group dynamic was a joyful experience. Ismael, Alvaro and Victor are true pros and a great asset to your tour package. They not only provided all the support required but did so with a friendly zeal that really enhanced the overall experience. As a frequent traveller and tourism industry executive (retired) I have always emphasised that beyond the destination itself, the most important ingredient of a successful group tour is the quality of the guides. These guys are winners. And they didn’t even buy me a beer for these accolades. Ernesto is the most enthusiastic, efficient guide I have come across and I have done quite a few of these holidays with Skedaddle now! This is one of the best trips we have had with Skedaddle. The scenery and the singletrack section on the final day were both fantastic! Ernesto and the guides were so patient looking after me. We have now done 6 cycle holidays and Jason is probably the best tour leader we have had. He puts huge effort into making sure that everything is well planned and right and is a really nice guy – but also fun. He and the team work really well together. Alvero – star driver and chef; Ismael – excellent No. 2 cycle guide with infinite patience; Victor – good fun and trusty trailer driver. 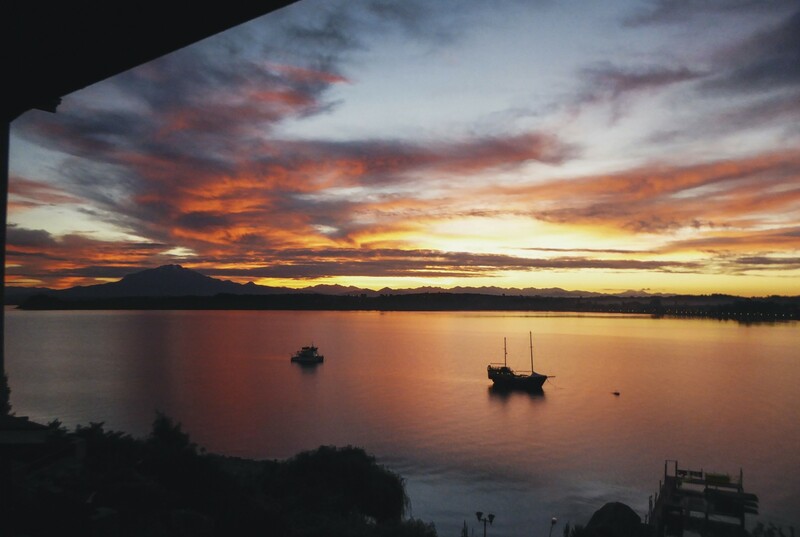 Accommodation Ranged from good/fun (cabins) to exceptional (Puerto Varas, Correntoso, Pucon). Overall very impressed with the range and quality of the accommodation. Every day was excellent in some way and it is difficult to single out just one. We were blessed by sunshine on almost every day and often helped on by a tailwind – who could ask for more? I have had bad experiences of bike hire from other companies so my expectations were not high. 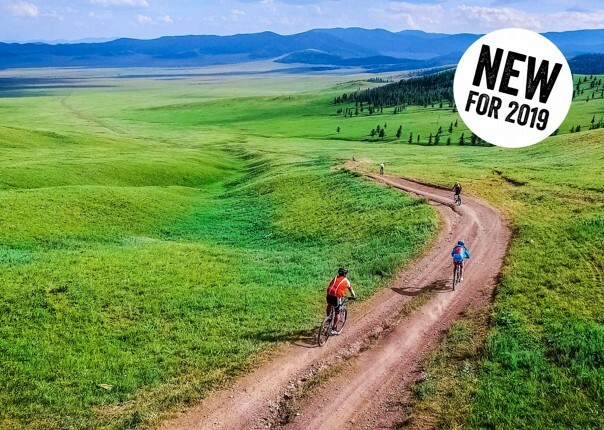 In the event, I was absolutely delighted by the new Cannondale Mountain Bike with its single chain-wheel and 11 speed block the size of a dinner plate. This gearing in combination with the 29 inch wheels was absolutely ideal for the hills and rough roads of Patagonia and Argentina. The bike fit at the start of the tour was excellent. Although everyone hired bikes on this tour, only a few folk had brought their own bike equipment – Ismail quickly fitted my SPD pedals, Brookes saddle and cantilevered rear rack. I was also impressed by Skedaddle’s chain lubrication regime and was amazed we were able to ride almost 300 miles, often on dusty roads, without any chain needing further attention. Apart from the rest day we stayed in a different hotel each night, so there were always going to be differences between them. Despite the fairly basic facilities of the wood cabins these were both fun to stay at because of their remote and unique locations. Two of the hotels offered particularly pleasant accommodation: Hotel Correntoso and the Playa Grande. Jason (our guide) did well to ensure that our expectations were in line with what was upcoming! 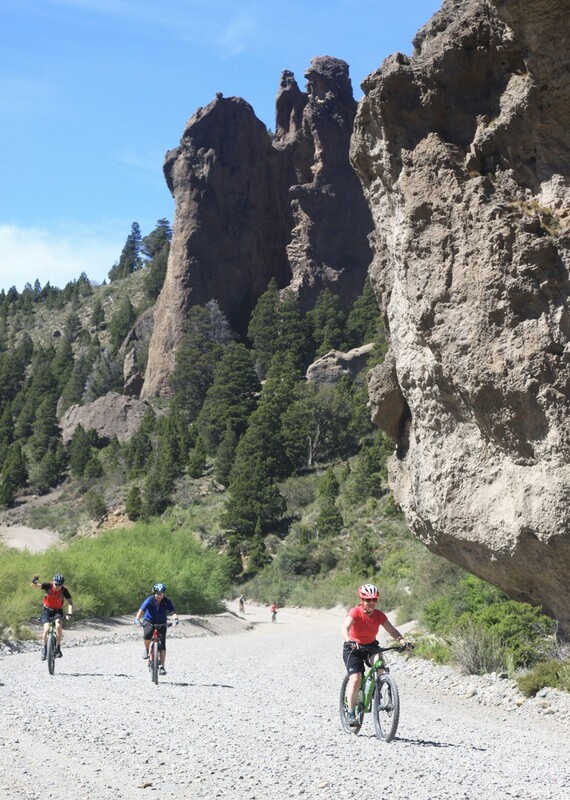 The last day was fantastic (not because it was the last day) with great scenery and fabulous cycling including a single track section that nearly converted us to mountain biking! 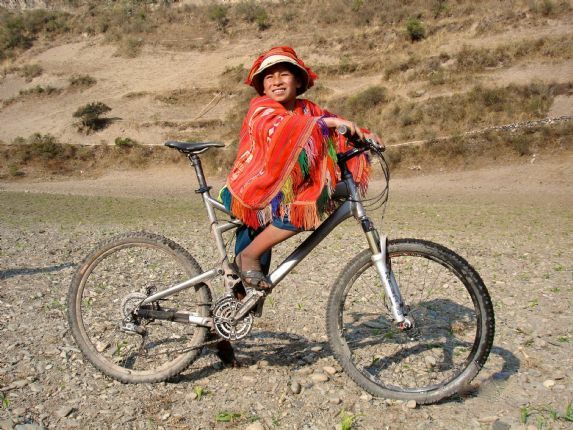 I would struggle to think of any way in which Ernesto could have done more to make the trip more enjoyable (well, maybe he could have paved over the gravel roads). He worked so hard to ensure that everyone was having a good time and was caring, thoughtful, perceptive, up-beat and good fun at all times. He is a real credit to Skedaddle! Constant good nature. Provided interesting information related to the areas we were going through. If there any glitches they were invisible to me. 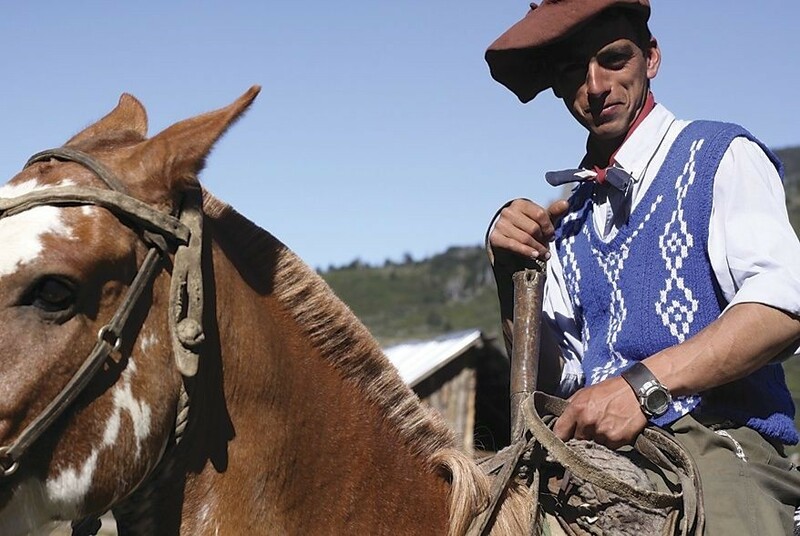 Ismael (the guide) …He knew so much about flora and fauna, was very approachable and funny, knew what he was doing and always was there with supportive gestures or words. I enjoyed my time with him as tour guide, I could even go as far as to say that the tour was as excellent as it was because of him! From start to finish, good clear information and communication. Always at great locations, and always with friendly and helpful staff. The two eco-lodges at Mitico and Parque Conguillio were wonderful experience, and the hotels in San Martin de los Andes and Pucon were of a great standard and central for a great experience on rest days. Jason was a fantastic tour guide, his ability on the bike, his local knowledge and expertise in the ecology and geography was terrific. I thoroughly enjoyed my experience with him (and the crew) and I know that is shared by the others. Great people who left a lasting impression. Fantastic holiday - best holiday ever! Thanks to the guys supporting us – they were amazing. All the guides (Ismael, Alvaro and Victor) worked extremely hard to ensure we were comfortable, happy and having a great time. Really friendly guys. Ismael particularly for his optimism and sense of humour but also his sensitivity. Loved Jason – he was an excellent guide and very informative. He also appreciated everyone’s needs and was very supportive making sure everyone was having a great holiday. I would definitely recommend a Skedaddle holiday! The helpfulness and patience of all the team was really good, I was the slowest and least confident, but due to the support and backup I ended up completing more rides and really enjoying them despite the difficulties. Jason was very professional and was extremely helpful in encouraging me to improve my cycling skills and in reassuring me when I worried about holding the others up. I feel proud of what I achieved on this holiday, it was the best holiday I have had mainly because I came home feeling I had achieved something. Thank you. Amazing! For anyone thinking about booking this trip, stop thinking and just book it. A fantastic trip. It’s one of the best group trips I’ve ever done (and I’ve done a lot). At the end I wanted to do it all again, maybe with a rest day! Jason and Alvaro make a fantastic team. They are one of the best guiding teams that I have had the pleasure to ravel with (probably the best). I really cannot praise their organisation, commitment, professionalism and kindness enough.